Over the past years, timber engineering tried to evaluate the load-bearing capacity of structural members in areas of connections with mechanical connectors, opening and notches by methods of fracture mechanics. The assumption of the fracture mechanics parameters leads to problems in evaluating the load-bearing safety of structural units of full and board laminated timber in loaded areas and disturbance ranges using fracture mechanics. Parameters close to reality can be gained only from experimental investigations into the determination of the crack expansion and the crack length with subsequent FE- simulation. For application in timber construction, numerous theoretical and experimental investigations have been documented and they contain joints, notches and openings subjected to transverse tensile forces. Due to the insufficient appropriation of measured data gained by tactile position encoders in conventional measuring procedures, it is advisable to investigate crack growth with the help of photogrammetry. With the measuring system which was developed within a research project it is now possible compared with the procedures usually used, to measure the crack geometry for the determination of fracture mechanics parameters in the post-process exactly. Additionally a complete picture of the local deformations and the validity of a test can be increased clearly by the possibility of the varying number of discrete measuring points. The measuring system for the contactless and non-destructive determination of the coordinates of the measuring points consist of a high-resolution digital colour camera in combination with a telecentric measuring objective. An especially developed procedure that is based on digital close range photogrammetry and image processing makes it possible to measure the progression of deformations, cracks and deterioration including the loading and relieving of the specimens. The validity of a test can be substantially increased by the applied measuring marks or a photo of the surface. The contactless determination of the coordinates is made by a photo sequence over the total duration of test and a following automated evaluation with the program OSPREY. As the evaluation is done in the post process, a frequency can be achieved in the test, of up to 2 Hz. Which leads to a good compression of the desired courses of the curves. The gathered displacements of the coordinates of the measuring marks or other geometrical marks are easily transferable for a following processing in a numeric simulation with an FE program. With the results achieved, which have an accuracy of few micrometres, new findings could be achieved in timber construction. The basis of the new measuring system is a high-resolution digital colour camera with a telecentric measuring objective. The camera has a resolution of 2580 x 1944 pixels with a picture rate of 5 frames/second. The pixel size is 3.4 x 3.4 mm2. The technology of the camera is based on a CCD- sensor, one of those that have gained acceptance in cameras for industrial image processing. A CCD- sensor consists of a geometrical grid of photosensitive cells. The picture information is represented by the number of electrons in the cells. The CCD- matrix camera send a digital picture, which is transferred through the framegrabber to the PC. With the help of different software, the image can be read out for further processing and for the analysis routines there. The selection of a suitable measuring objective is important for the measurement. The object to be measured should be represented as largely as possible allowing for the necessary measuring accuracy. The telecentric measuring objectives JENmetarTM 0.2x/12 and JENmetarTM 0.13x/12 used allow a maximum measuring field of 67 x 49 mm2 with an magnification of 1:5 and. 1:7.5 respectively. Both objectives have a parallel optical path in a range from 21 mm and 18 mm. This guaranteed a constant reproduction scale with the variation of the distance between objective and camera. On the basis of a pure 2D-measurement, the specimens can move slightly in the depth without creating a distortion of the measurement results. For a sufficient measuring tolerance, the shape of the measuring marks should constitute at least 10 pixels. A mark diameter of 2mm corresponds to approximately 120 pixels at a magnification of 1:7.5. Objectives with a smaller magnification provide a better clearness in the measuring field but they create fewer pixels in the figure of the marks and thus a higher measurement uncertainty. Fig 1: Structure of the measuring system consisting of the CCD- camera, the infrared lights as well as the PC and the multi-measuring system. Contrast and the evenly distributed illumination of the entire image field are decisive for the future results of measurement. Since the applied software requires a grey tone picture for the optical determination of the coordinates of the measuring points, the measuring field is illuminated by a source of infra-red light for the close infrared range. By means of an infrared passage filter, the complete visible spectral range of 400 - 800 nm is filtered away. The environment light has thus no more influence and the camera behaves, when simultaneously switching off the interpolation routines, like a grey tone camera with 5 million pixels. For marking the wood surface, the pretreatment of the surface with a white wax glaze in combination with transfer marks applied afterwards, turned out to be a good method after extensive analyses. A sufficient black-white contrast is obtained by this combination, which provides the necessary grey tones by the two dimensional infrared lighting. The transfer marks vary in diameter from 0.6 to 2.0 mm. A sufficient bond of the measuring marks with the surface could be proven on the basis of smaller test series. This procedure of marking the specimens does not interfere or even destroy their structure as penetrating marks such as pins or drawing pins do. For the test first the specimens are marked with the measuring marks according to the measuring task. During the test the coupling of the force signal and the picture sequence is necessary for the later evaluation of the results. Since the evaluation takes place in the post process, the synchronisation includes measuring of the force signal with simultaneously releasing the measuring photo. For this the real time measuring basis MGC- Plus of the company Hottinger Baldwin Messtechnik is used. The coordination could be solved after intensive test runs with a program based on a script. Using this suitable automation, measurements under real material test conditions with a frequency of up to 2 Hz are presently attainable. The determination of the coordinates of the applied measuring points is carried out with the software program OSPREY. The basic procedure for the measurement with the CCD matrix camera is similar to the classical optical measurement with a tool microscope. The object to be measured is reduced in size and shown on the CCD matrix. The pixels on the CCD-chip of the camera are the solid measure, because their geometry is fixed. The program OSPREY serves the measurement of concretely geometry elements with the help of the coordinate measuring technique. The search range for the circle touching is stretched by a touching circular arc and a crowd of search rays arranged radial to the touching circular arc. From the points of outline, which found the individual search rays according to the used edge criterion, the centre of the measuring mark is computed. In the current measuring tasks high-contrast object edges are touched, why the procedure -dynamic threshold value- is applied. With this criterion according to the analysis of the picture brightness in the measuring field the threshold value is determined automatically at the edge transition by means of the histogram. Experience has shown that the optimal separation between the dark object and the bright background is achieved. If the brightness of the background or the object changes, the threshold is automatically adapted to the new conditions. The dynamic threshold value is supplemented by the approximation of the edge to determine the edge place at the interface between the edge function and the dynamic threshold value subpixel exactly. With this procedure, a touching uncertainty of 1/5 pixel for the single point can be regarded as surely attainable. The attainable reproducibility of the photogrammetric touching of the measuring marks with the system developed is, depending upon the objective used, subject to the standard deviation of 0.4 and 0.5 mm when the subpixel method is used. By means of calibration equipment for inductive displacement gauges the touching accuracy of the picture measuring system for individual measuring marks was determined to 1 mm. The calibration equipment used supplied a measuring resolution of 10-7m. In first test series for the adaptation of the measuring system to the measuring tasks, measurements of length and deformation were carried out. For this, three point bending tests and four point bending tests from different wood -beech, ash and spruce- were used. On the basis of the determination of the deflection of the specimens according to DIN EN 408 1996, a good correspondence could be achieved over the period of loading and relief, as soon as figure 2. Fig 2: Test arrangement for four-point bending tests and curve progression reached for the deformations of old beams. Simultaneously, the influence of the creep effect occurring in the timber specimen under constant load stage was examined for succession of picture sequences as well as for a possible change of the camera position to enlarge the measuring field. As a result can stated that with timber specimens a change camera position during one load stage cannot be applied successfully, since the deformation state of the specimen does not stabilise sufficiently within a suitable period, an therefor several synchronised camera systems would be necessary for a possible enlargement of the measuring field. The measurement of strain was first carried out at tension member following DIN 52188-1997. The dimensions and the arrangement of the point grid can be seen in figure 3. As a conventional measuring procedure a extensometer DD1 with as measuring accuracy of 0.05% was applied at the back. Fig 3: Dimensions of the specimens and arrangement of the measuring field. For the evaluation of the measurement results the modules of elasticity for tension was determined in each case. In table 1, the attained results for the materials beech and spruce are compared. One to the relatively high modules of elasticity of wood and the smaller strain resulting from that, the good accuracy classes would, as expected, not be achieved at DIN-efficiency. Table 1: Module of elasticity determined in the tension tests according to DIN 52188-1997. By increasing the load over the DIN range and additionally extending the measuring length, the accuracy of the determination of the longitudinal strain could be improves by up to one tenth. Due to the positions of spring wood and late wood in the cross section, the scattering of the accuracy of the modules of elasticity in additionally influenced by the inhomogeneity of the timber. An important field of application of the measuring system that has been developed is the measurement of the crack opening and crack length for the determination of fracture mechanics parameters. Before the unstable separation of the timber body, a stable crack growth can often be observed. Numerous theoretical and experimental investigations have been documented for the application of the fracture mechanics in timber construction and could be used to compare the results of our work with them. It was obvious to examine the crack growth by means of photogrammetry because the measured values of tactile measuring procedures like at conventional measuring procedures have not been sufficiently classified up to now. The test series was carried out at CT samples. Fig 4: Marked CT-samples for the test and the curve progression of the resistance to cracking attained from the test results and the numeric simulations. In contrast to the usually common procedure to determine the fracture mechanics parameters at CT- samples in the post process, the measuring procedure developed in our project can measure the geometry of the cracks in the measuring photos exactly. In the experimental investigations, the crack propagation could be determined exactly to within 10mm. With the attained lengths of the crack and their transmission to an FE simulation by means of the program ANSYS(r), it was possible for the first time to determine the curves of the resistance to cracking for wood. A complex of problems important in building practice is the dimensioning of a flexural timber girder with notches in the supporting area. In the present standards, there are different design concepts which are based partly on empirical investigations or fracture mechanics estimation. The measuring procedure developed gives the opportunity to evaluate the design concepts used so far and to develop then further by a more exact determination of the strain an the development of cracks. Measurement at a straight notch of a glued laminated timber beam has been carried out. The test was continued until the beam failed. Over a test period of 10 minutes the required measuring photos were released controlled by the software with a frequency of 2 Hz and the measuring signal was prompted simultaneously. Notches represent a discontinuous change in the cross section. At the understudying corner, high stress concentrations are created due to the stress redistribution present there. Figure 6 shows the lateral expansion determined from the edge of the measuring field to the notch depending on the lateral forces applied. Fig 5: Measuring area (67x49mm2) at the kerf of the notch. The relocation and or the reduction of the perpendicular tensile stresses in areas which are further from the notch and less stressed can be shown with this new measuring procedure. In comparison with that, in figure 7, the flow of the perpendicular tensile stress is shown, which determined in an FE simulation with the program ANSYS(r). One can clearly see, that our measuring procedure allows the determination of strain gradient in a realistic way. Because of the size of the measuring field available at the moment, it was possible to obtain a complete image of the entire area subjected to transverse pull/ tensile stresses perpendicular to the grain and of the crack development. By additionally record the crack growth we could however in combination with a numeric simulation, determine curves of the resistance to cracking. To observe the cracks further and thus to compute the curve progression complete, an enlargement of the measuring field and or the parallel employment use of several measuring systems would be necessary. Fig 6: Transverse strain of the point rows subject to the load. Fig 7: Tensile stress perpendicular to the gain sy at the kerf in the deformed condition. In first test series for the determination of the strength behaviour which is depends on the strain very good, a new findings could be achieved in the range of plastic strains because of the formation of the kink band. By the applied measuring grid, strain and therefore modulus of elasticity as well can be determined for each area. Further more exact strength behaviour can be determined for the range of kink band. With experimental investigations carried out so far this was possible only over much wider range or over the length of the specimen, so that the determination of the parameters for the descriptions of the strength behaviour was subjects certain errors wrong assumptions. Figure 8 shows the measuring field in the deformed condition in the one hand and the determined compression compared with there unloaded condition on the other hand. The formation of the kink band starts after 100s, when the maximum load is reached, which can be seen in a clear increase in the displacement in section 14. At 300 s as can be seen in figure 8, the kink band extends first into section 11 then into section 9 and 12 and the compression gets up to 2.7 mm. Fig 8: Timber specimen loaded in the test equipment, representation of the measuring field in the de-formed condition of the specimen, the associated section-wise compressions of all rows for t=300 s.
In many fields of civil engineering the photogrammetry measuring system that has been developed within the researched project can lead to new experiences. The test series that have already been completed provide a lot of results which contributed a considerably to new findings in timber constructions and to opening new opportunities in the field of experimental analyses of stress and of experimental technique. Especially the cracking of concrete units seems to be a worthwhile field of work. The application will extend to the continuation and the future development of the experimental investigations into the determination of the curves of the resistance to cracking for wood and to the determination of important parameters for the fracture mechanics simulations. This measuring procedure will also be used to evaluate the load bearing performance of connections with mechanical fasteners in timber constructions more exactly. Hereby the evaluation of the load bearing capacity of cross connections including of crack growth and the photogrammetry pictures of relative displacements of the fasteners is a main area of investigations. Maas, Niederöst: The accuracy potential of large format stillvideo cameras. Videometrics V, SPIE Proceedings Series Vol. 3174, SPIE's 42nd Annual Meeting, San Diego, 27.7. - 1.8.1997. 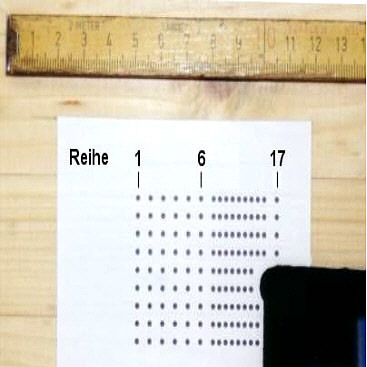 Schatz: "Zur bruchmechanischen Modellierung des Kurzzeit-Bruchverhaltens von Holz im Rißöffnungsmodus I Dissertation Stuttgart (Eigenverlag) 1994.